Would you like to organize the fourth MARVEL Junior Retreat next summer? 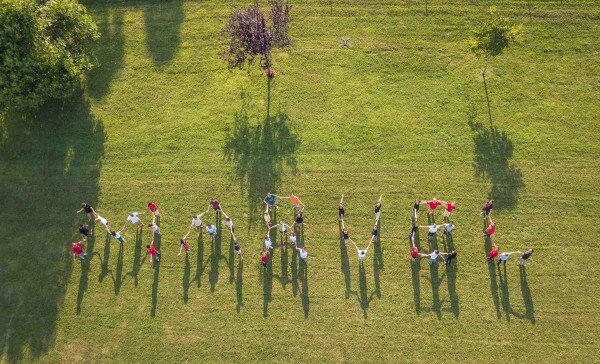 Read about the 2017 retreat that took place in Magliaso, Ticino and get a taste of this special event! All the participants in the 2017 MARVEL Junior Retreat. 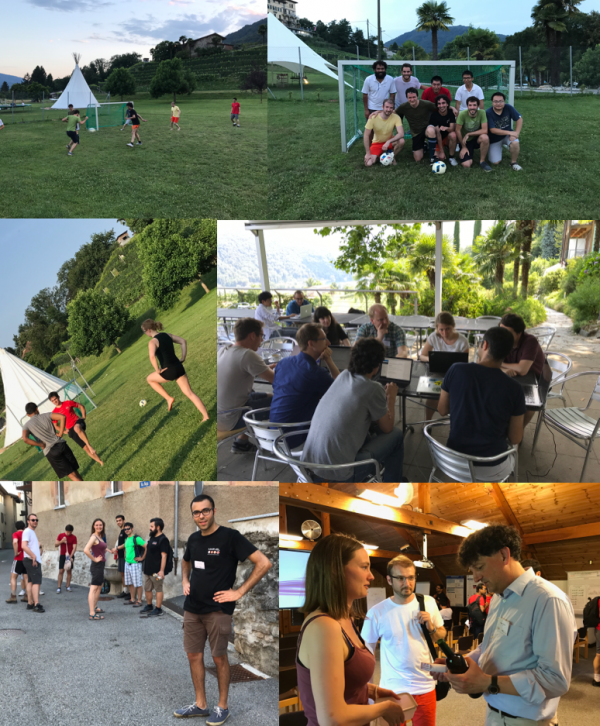 The three-day MARVEL Junior Retreat that took place on July 3-7, 2017 at Hotel Paladina in Magliaso, Ticino was attended by 48 participants, most of whom were MARVEL PhD students and postdocs. Organized by a committee of four postdocs —Senja Barthel, Vamshi Katukuri, Fernando Gargiulo and Vladimir Rybkin— as a means of vigorously addressing challenges revealed over the course of the first three years of the NCCR, its main goal was to stimulate collaborations between young researchers by proposing realistic research projects to be pursued independently. The format was somewhat different from a scientific conference. Oral presentations by one representative from each of the groups associated with MARVEL focused on outlining the topics of interest (those currently being undertaken, as well as those for future pursuit) and the available expertise/tools within their groups. Every participant had also the opportunity to present their own research background and interests during an informal self-introduction event. This event combined with the oral presentations greatly helped in forming small groups of participants, each devoted to establishing a collaborative project. The bulk of the retreat was dedicated to discussions within the groups to design their projects. Presentations and group work during the 2017 MARVEL Junior Retreat. The program also included three invited lectures: the introductory lecture by Prof. Michele Parrinello (USI & ETHZ), a talk on intellectual property by Dr. Mauro Lattuada, technology transfer manager at EPFL, and a lecture on industrial applications of quantum simulations by Dr. Ansgar Schäfer from BASF. These additional insights together with social activities, i.e. hiking, sports and social dinner, served to facilitate the main objective of the retreat: to create a friendly working atmosphere and to boost collaborative brainstorming actions. Social activities enhanced the working atmosphere during the 2017 MARVEL Junior Retreat. 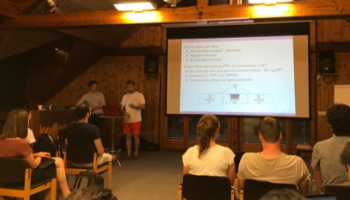 On July 7, nine projects, conceived by junior researchers from at least two and up to three different institutions, were presented to the whole group. Two proposals were officially presented at the MARVEL Review and Retreat two months later. 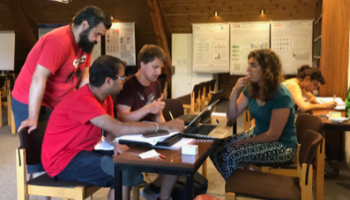 Feedback by the participants was overwhelmingly positive, with more than 90% of the participants agreeing that they have learnt new things about NCCR MARVEL and each other’s work through talks, posters, project presentations and informal discussions. Invited lectures were also well received and several topics were suggested for the future Retreat(s), including presentations on “flagship” projects, the future of scientific publishing and more talks on industrial opportunities. Finally, the retreat was successful in launching new collaborative projects. If you're eager to join the team and organize the 2018 MARVEL Junior Retreat next summer, please contact Nathalie Jongen as soon as possible. The call for volunteers is now open! Story by Vamshi Mohan Katukuri, Senja Barthel and Vladimir Rybkin. Edited by Nathalie Jongen, 27.11.2017.